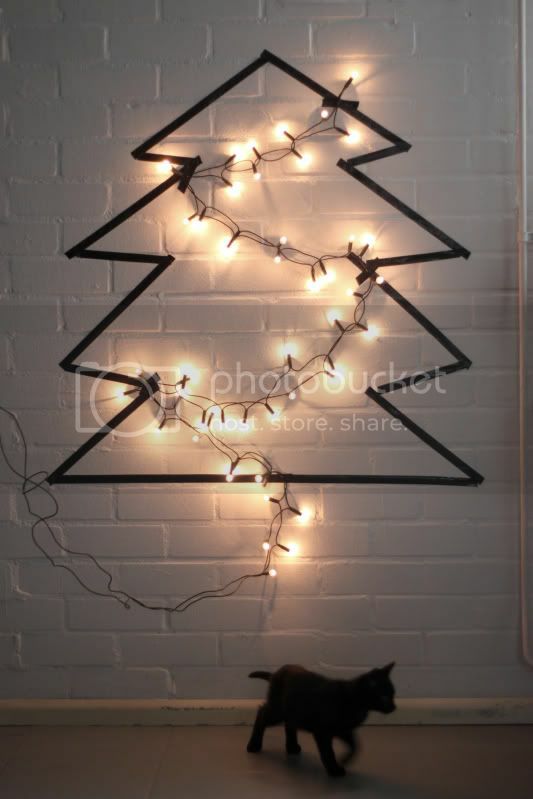 All you will need for this no-fuss DIY Christmas tree is a roll of narrow black duckt tape, some Christmas lights and 15 minutes. I was going to write a couple of words with instrutions, how great this is for those who don't have time, for students... but it's so simple that there isn't that much to say. 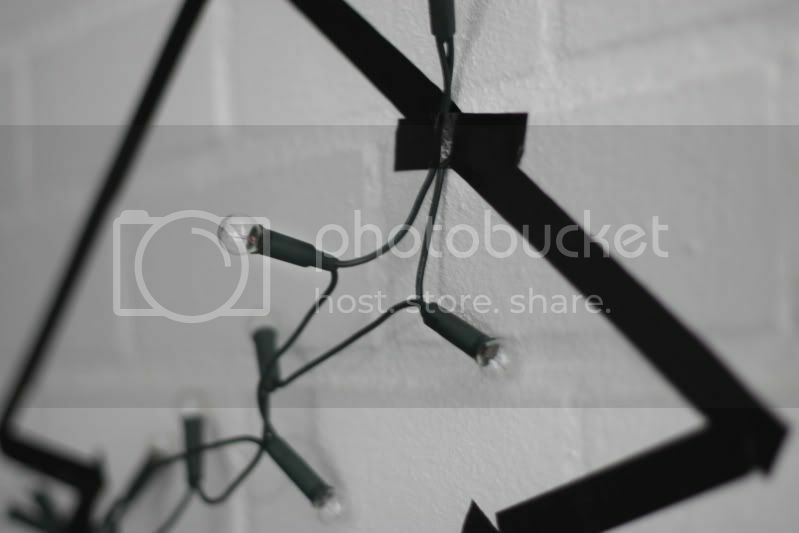 Good luck taping lights to your wall! this is so cool the tree! Oh, this is sooo lovely! Really an amazig idea, it's simple to make but leaves a nice impression! The interactive photo show how easy it is! well this is a modern tree if i've ever seen one. such a cool idea. And do I see a kitten in the first picture? So cute! Erg leuk en simpel idee! Echt 'n leuk resultaat! Wat ben je toch creatief, erg leuk idee weer!! You are probably the only person on earth who can make Christmas work with cool minimalism. This is a great idea. Again! That is so awesome!! Great job! i just love this clever idea! thin black duct tape works very well; alternately, silver would be quite festive. Just love it. Why make christmas more complicated then this? Great DIY. I miss some DIY paper stars! OMG, so great for city dwellers who can't have trees! So simple, but very nice idea. I like it! … agree to everybody that loves this idea, and how awesome is the cat in the first picture?! I love your christmas tree! awesome idea! haha, waarom heb jij al tijd de beste ideetjes! heel leuk gedaan! It looks great, plus there's no pine needles to clean up after the festive season. what a great idea - a puristic christmas tree! I love this idea, so simple! you amaze me. possessing such creativity remains one of my biggest wishes. Saw this on Tumblr, what a great DIY idea. Wat een gaaf idee, en zó makkelijk ook! Heb witte muren in mn kamer, dus ga het daar een keer op uitproberen :). The cat makes the whole thing just perfect. + it's a really neat idea, for example, I'm living abroad right now, going home for Christmas AND living on the 5th floor with no elevator so there's no way in hell I'd buy myself an actual Christmas tree, but I still love the lights... I might try something similar. hahaah this is such a cute idea. Thanks for the inspiration! Cool idea! But please tell me, does this duct tape leave any marks on the wall? Really good idea haha ! Good question, initially I wanted to do this on a wall covered with wallpaper but didn´t want to take the risk. 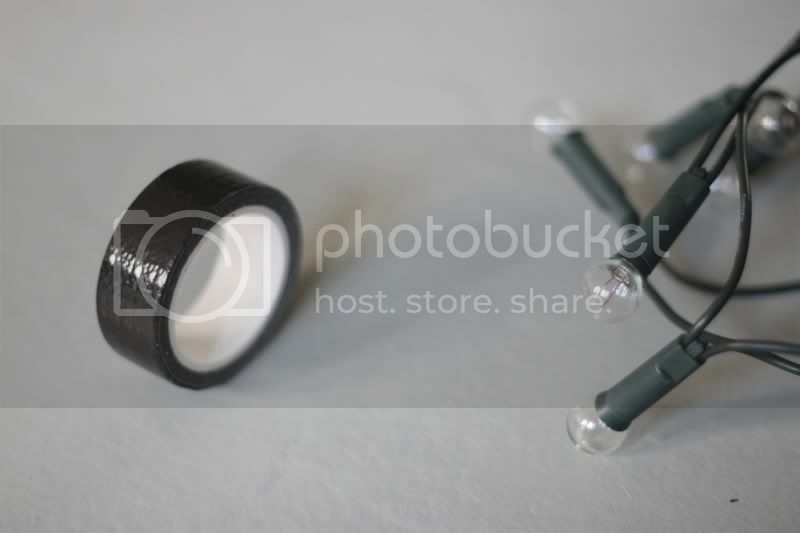 On these painted bricks it works just fine, and the paint doesn´t stick to the duct tape. You're DIY-projects are always great, unique and inspirational! haven't searched anything, but this is perfect! think i'll do this tomorrow somewhere in my crib. thanks, you're awesome, like your blog! This looks soo fun and creative! I am so blow away with the types of cool, crazy and utter creativeness you come out with. In my opinion, there is no blogger quite like you, your stuff is the freshest of the fresh! That is more good looking to me. You gave some good ideas here. that is so awesomely genius! Oh my goodness this is perfect, we are moving just after christmas so don't want to do the whole tree thing. What a great solution. Great! What an easy, instant Christmas tree decorating idea! I simply love it and may I can try it for my room. ;-) Thumbs up!